It is the far future. Humanity has spread to the stars and colonised hundreds of worlds. The bonds of politics, trade and culture that once united the human worlds are now tearing them apart, as the galaxy plunges into anarchy. Civil war, trade war, invasion, rebellion - a tide of conflict is sweeping across known space. Warfare is dominated by the most advanced weapons of destruction ever created. Iridium-armoured supertanks, driven by sun-hot fusion engines and armed with lethal powerguns. These vehicles are so expensive to run and so complicated to operate that few worlds can afford to maintain their own tank regiments. 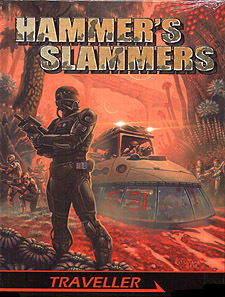 Based on the novels and short stories of David Drake, Hammer's Slammers is a brand new setting for the Traveller roleplaying game. Players will take the part of tank crews and specialists within the best known and most capable mercenary unit in the galaxy! This full colour hardback is packed full of the history of the Slammers, the weapons, vehicles and tactics they use, new careers - all rounded off by a series of missions to get you started. With all vehicles created using the Traveller Vehicle Creation System, this book is guaranteed to be fully compatible with every other Traveller book, allowing you to mix and match supplements as you desire! You will need the Traveller Core Rulebook to use Hammer's Slammers.